Noah Strycker knows a thing or two about travel. He knows more than a thing or two about birds; he has the endurance of an Olympian, the athleticism of a marathoner and the ability to solve tough problems of, well, a Noah Strycker. He’s a young man from Oregon who set out on the first day of 2015 to see half the world’s bird species in a single year. It was an impossible goal, involving, among other things, amazing skills at traveling, living on the cheap, organizing and planning a wildly complex task and, oh yes, having a cast-iron stomach and an ability to seemingly get along with little sleep for days on end. Please, if you’ve followed me this far, do not think you must be a birder or even care about birds to follow this tale, for it is a remarkable travel account by a brilliant, highly motivated individual. What’s more, it proves once again that there are virtually no limits to the abilities of a bright, determined and highly motivated individual. As he himself says, none of what he did would have been possible in the pre-internet days. Strycker, who had already through-hiked the 2,660-mile Pacific Crest Trail, is an editor at a birding website and leads birding tours, many of them to the polar regions. Taking advantage of the internet, and of the worldwide proliferation of interest in birds and birding in the last couple of decades, Strycker spent months planning a route and contacts in dozens of countries on seven—yes, all seven—continents. Thus you have, in this one 365-day account, an incredible birding narrative but, moreover, one of the most remarkable adventure-travel tales written in decades. 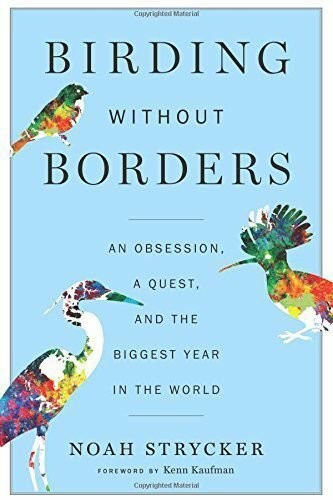 To put a fine point on it, even if you don’t care about birds and birding, to vicariously live this dazzling story of travel to the far corners of the globe, is stunning. It makes you think. Well, it made me think, anyhow, about a lot of things. Not least of these is the sheer logistics of accomplishing what Strycker did. What’s more, not being born to money, Strycker (not yet 30 when he made his world tour), proved a point that I have pounded in for years: You do not have to be wealthy to see the world. What you do have to be is resourceful, determined and innovative. Over and again, Strycker proves his ability to deal with the unexpected. As he gazes down on the Peruvian countryside from Tielio Pass, high in the Andes Mountains where the air is thin and cold at 16,000 feet, our intrepid birder is 45 days into his special year and battling attitude sickness. A Peruvian birder along for this part of the adventure snaps a photo of Strycker. “In the photo, I am smiling in front of the Andes Mountains, standing alone with feet shoulder width apart and hands stuffed deep in the pockets of my black down jacket,” binoculars dangling from his neck. I have to say, not only is Strycker a master-birder and naturalist, he knows a thing or two about telling a tale. A wonderful, original story, well-told. That’s “Birding Without Borders.” Next time you’re online, take a look at his blog: Noah Strycker: Birder at Large.